One of the most persistent of all conspiracy theories, the notion that man never set foot on the moon gets a new exploration via 2016’s Operation Avalanche. 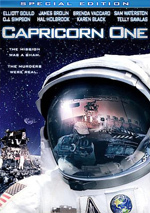 Set in 1967, CIA executives fear that a Soviet mole works inside NASA’s Apollo program. To counteract this potential threat, the CIA sends agents Owen Williams (Owen Williams) and Matt Johnson (Matt Johnson) undercover. They go into the Apollo process under the guise of documentary filmmakers there to do a piece on the program. They encounter revelations more shocking than they anticipated and become part of the cover-up. Though these discoveries may stun the movie’s characters, they seem less likely to impress the viewer. 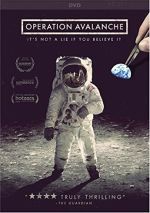 Essentially Avalanche simply offers a “found footage” flick that looks at how NASA faked the moon landing – other potentially dramatic moments emerge, but that remains the main theme. It’s not a tale that proves to be dynamic – at least not as depicted here. For one, the “found footage” or “fake documentary” motif doesn’t really work. I see no real need for its usage to tell this narrative, as I can’t think of a reason “found footage” works better than traditional techniques would. After all, we know that Avalanche fictionalizes events, and I don’t see how the faux realism of the shooting styles adds to the experience. Some stories make sense for “found footage” or at least use the techniques to their advantage. Sure, one could tell Cloverfield as a traditional film, but the first-person POV gives it a creative twist. That doesn’t occur for Avalanche, as the “found footage” motif lacks purpose. At no point does the movie seem realistic, and the pseudo-documentary style doesn’t coalesce into a convincing package. It doesn’t help that the amateurish performances torpedo all potential verisimilitude. Largely a bunch of Canadians who never attempt to hide their accents, the actors can’t convey characters in a remotely convincing manner. This seems especially true for co-writer/director Johnson, who gives his role an odd comedic bent. Matt always feels like a silly goofball and not someone with any skills. He and the others harpoon any sense of realism via their problematic performances. Even without the bad acting, I doubt Avalanche would go much of anywhere. It simply lacks much forward momentum, and its awkward use of the “found footage” format doesn’t work. It winds up as a disjointed experience that never really involves the viewer. Operation Avalanche appears in an aspect ratio of approximately 1.89:1 on this single-sided, double-layered DVD; the image has been enhanced for 16X9 televisions. Given its status as a “found footage” film, expect intentionally degraded visuals. I found it awfully tough to rate the image of Avalanche because in an objective sense, it looked terrible. Of course, it was supposed to look bad, as it was meant to come from decades-old material shot under poor circumstances. Plenty of footage was intentionally soft and fuzzy, and we saw dull colors, flat blacks and muddy shadows. We also saw lots of specks, marks, debris and scratches put onto the footage to create the illusion of old, neglected film. All of these made the movie ugly to watch on a consistent basis, but that’s how it was intended to appear. The DVD seemed to replicate the source material in a pretty accurate manner, one that I’d find it hard to think Blu-ray would improve. After all, if the movie’s supposed to be messy and soft, would a higher-resolution format make it better? In terms of my grade, I went with a “C”. That could be “C” for “Cop-out”, as the transfer would deserve a higher mark if I simply graded relative to the way the image replicates the source. But I don’t like to grade solely based on fidelity. I understand arguments to rate that way, as I can see why it doesn’t seem fair to give a DVD a “C” picture grade if it faithfully represents the source. However, I think that most readers expect an “A” picture mark to represent something that looks great in an objective sense. If I give a flick like Avalanche an “A”, many may be disappointed to see what an ugly mess it actually is. This is an inherent flaw in something like the letter grades, but I feel the “C” for Avalanche is a reasonable compromise. Objectively, the flick looked terrible, but the DVD replicated it in an appropriate manner. I don’t need to be as subjective with the generally good Dolby Digital 5.1 soundtrack of Avalanche, though I’m always annoyed by “found footage” movies that offer multichannel audio. Logically the material should’ve remained essentially monaural since it’s supposed to come from the source. However, as was the case with many other flicks in the genre, the filmmakers decided to take moderate auditory liberties and open up the soundfield. Most of the audio focused on the front center, with music on the sides and occasional flourishes from the effects in different locations. These components brought out a little involvement, but much of the track kept within a limited scope. Audio quality seemed good. Speech was natural and concise, and effects showed solid range. Music appeared full and rich. Though this wasn’t a killer mix, it was fine for the material. Packed with extras, the DVD presents three separate audio commentaries. The first comes from writer/director/actor Matt Johnson, as he presents a running, screen-specific look at the project’s origins and development, the loose script and improvisation, sets and locations, cast and performances, camerawork and period elements, connections to earlier work, ethical considerations of the production process, effects and technical components. Overall, Johnson provides a good commentary but not one that really excels. Though he remains chatty at all times and offers some useful notes, he never digs quite as deep as I might like. Still, there’s a reasonable amount of information to be found here. For the second commentary, we hear from directors of photography Andy Appelle and Jared Raab, colorist Conor Fisher and 16mm film artist Pablo Perez . All four sit together for their running, screen-specific discussion of camerawork and visual areas, effects, locations and related domains. With the intentional degradation of the film and the various attempts at a period feel, some of this information works well – but not enough to fill 90 minutes. While I enjoy technical details, this track tends to lack a lot that strikes me as especially stimulating. It’s not a terrible chat but it tends to be dull. Finally, the third commentary involves producer Matthew Miller, editor Curt Lobb and VFX supervisor Tristan Zerafa. These three sit together for a running, screen-specific examination of sets and locations, cast and performances, editing, deleted scenes and story structure, production design and period details, music, effects, and connected subjects. Of the three commentaries, this one probably works best. It gives us a good level of information and remains fairly engaging as it goes. While I wouldn’t call it a great track, it does fairly well for itself. Four Deleted Scenes fill a total of seven minutes, 12 seconds. We find “A Huge Mission” (2:38), “Setting Up” (1:53), “Webb Tap” (1:00) and “Shut It Down” (1:41). These offer unnecessary exposition and bland character moments. They add nothing. We also get five Behind the Scenes Featurettes. These encompass “Operation Avalanche” (6:35), “Car Chase” (4:01), “Pool Party” (2:50, “Reanimating Kubrick” (4:47) and “Vice Presents The Making of Operation Avalanche” (6:43). Across these, we hear from Johnson, Appelle, Raab, Lobb, Zerafa and Miller. The first three consist solely of unnarrated footage from the set, so the interviews come wth the last two. All five add up to a passable view of the shoot, with a smattering of insights but not a lot of real depth. The disc opens with ads for American Pastoral, The 9th Life of Louis Drax, Manh(a)ttan, Don Verdean and The Whole Truth. No trailer for Avalanche appears here. A “found footage” take on a moon-landing related conspiracy, Operaiton Avalanche lacks much to make it exciting. The movie tends to plod along without much drama or forward momentum. The DVD offers appropriate visuals as well as adequate audio and a long roster of supplements. The movie comes with a promising concept but it feels too amateurish to succeed.